If your holiday wish list consists of sunny days with ocean views, glasses of sangria or cocktails, sunsets followed by starry moonlit nights, fun packed evenings with live entertainment... impossible? 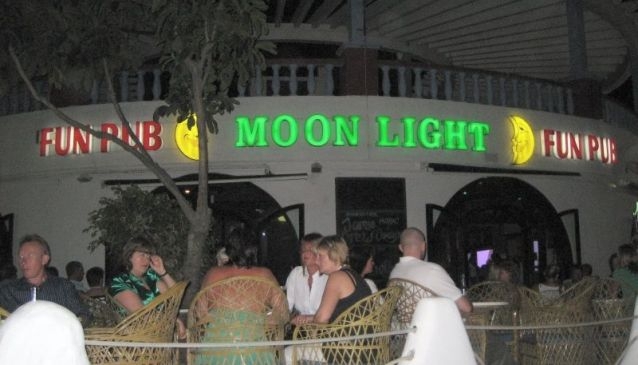 Not at the Moon Light Fun Pub looking out on Fanabe beach and over to La Gomera. Combining the best of all worlds, peaceful by day for that afternoon libation, scerene as you watch the sun go down, 'twinkly' by night and then 'rocking' into the small hours. Starting with a lively karaoke at 9.00pm, the professionals hit the stage at around 11.00pm just when you begin to lose track of time... never mind, no work tomorrow.